Chevy’s 2017 Bolt EV is a nice car for a long trip. Period. No EV ifs, ands or buts about it. As with any EV, the Bolt’s range limitation does require some trip planning before you depart, and quick-charge stations are mandatory for a decent road trip and can’t yet be found in decent quantity in all states. But if you are interested in a Bolt EV and live where they are available, don’t be afraid to travel. You may want to invest in a dash cam from BlackBoxMyCar too before travelling around on roads you are unfamiliar with though. Even the extra time added to a trip by stopping for a charge every couple of hours isn’t a burden – at least it wasn’t for us on a recent two-day trip in a 2017 Bolt EV from our home in Southern California to the Central California wine region around Paso Robles. The trip was accomplished in a comfortable, well-equipped, nicely handling, quiet car, with much less environmental impact than if we’d been driving a comparable gas or diesel vehicle or even our personal car, a plug-in hybrid. In return, we spent perhaps an extra 90 minutes in transit over the course of 591 miles in two days, and we spent just under $5 more on fuel – electricity from commercial fast-charge stations- than if we’d been paying for gasoline for a 30 mpg “conventional” car. The fast chargers are expensive, but EV drivers don’t use them every day – charging at home overnight costs just a few pennies per mile. If you have a home solar system it costs us even less. The fast chargers are there to facilitate longer trips than the usual daily commute, and the cost can be a bit more than for gasoline. But unless you are using fast charging every day, that cost (it’s actually on-the-road access to the electricity you are paying for) on the occasional weekend and vacation trip is negated by the savings from using home charging most of the year. BTW: I know that Tesla has its own dedicated network of fast-charge stations and the cars have bigger battery packs (and correspondingly bigger price tags), so Tesla world is different from the one I’m describing for other EV drivers. And yes, California has lots of fast chargers and most states don’t. A trip of this length in a 2017 Bolt EV may not have been doable – yet – in Mississippi or Montana or Michigan or any one of dozens of other states. 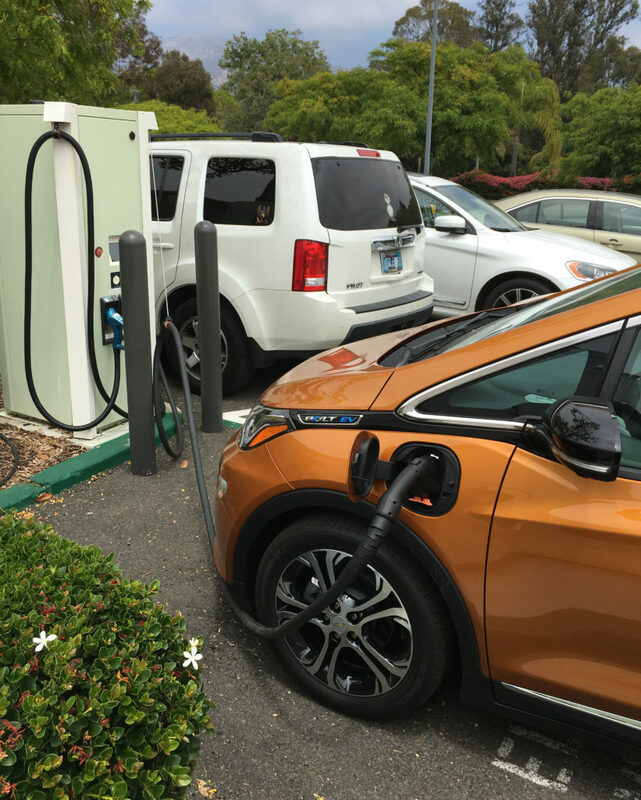 But California’s support of EVs and EV charging, coupled with the new generation of longer-range EVs that Chevy kicked off with the launch of the 2017 Bolt EV last year, show that it can be done once a critical mass of charging stations is installed. Fortunately, companies such as EVgo and ChargePoint still are working to do just that, despite the new political landscape that seems to place no value on caring for the environment or trying to get off of fossil fuels. My wife and I recently took an overnight jaunt to the Paso Robles wine country in a 2017 Bolt. Most of the trip was on California’s Highway 101, at freeway speeds. Along much of 101 between Santa Barbara and San Luis Obispo, that means cruising at a fuel-gulping 75-80 mph. We were not hypermiling; weren’t trying to see how little electricity we would consume. We drove the Bolt like we’d drive any car. 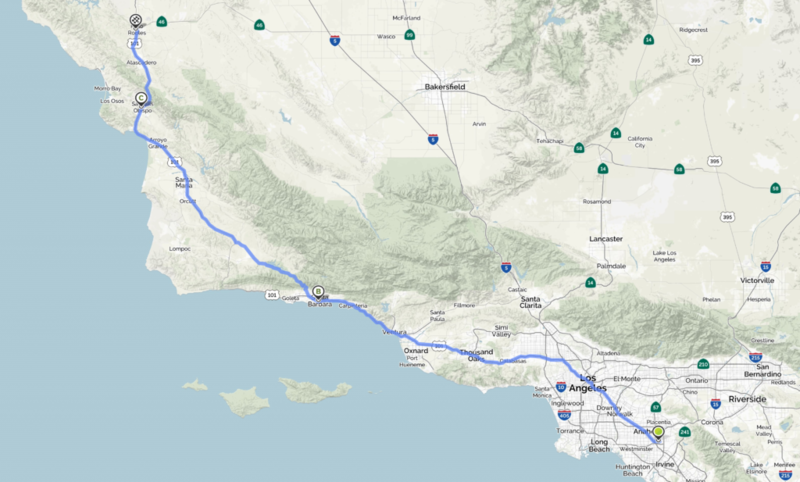 Total distance covered, including a side trip for dinner in San Luis Obispo – locals call it SLO – on the first day and visits to wineries and our favorite olive oil supplier in the hills around Paso Robles on the first half of day two, was 591.5 miles. Four of our charging sessions – two on the way up and two on the way back – took 30 minutes each, and we took an extra 30 minutes for an extended session at one of them on the way home. All four were part of the EVgo Network and the cost on their pay-as-you-go plan was $9.95 for each 30-minute session (enough for about 70 miles of range). 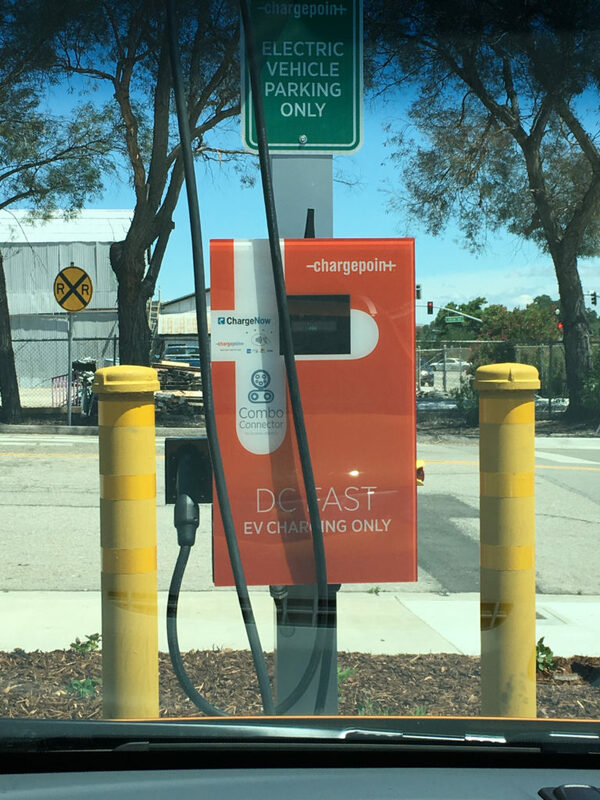 The middle fast charger, used while we were eating breakfast after an overnight stay in Paso Robles, was a ChargePoint Network station that operated at just 24 amps – versus 50 amps for the EVgo stations. It took an hour but gave us 101 miles of range for a cost of $15.22. Fast-charge stations like this one in Santa Barbara, Calif., make it possible, even easy, to take trips in an EV. Because we ate lunch during one charging session on the way up and dinner during one on the way back – meals we’d have stopped for even in a gas car- I’ve subtracted those and the breakfast session from the time that charging added to our drive. That left a total of 90 minutes of extra time on the road –30 minutes on the way up and an hour on our return. Total cost for the charging sessions was $64.97, or 10.9 cents a mile. Fuel for a 30-mpg gasoline burner on the same trip would have cost about $60 at the then-average of $3.05 per gallon (remember, this is California). And, of course, most cars, vans, pickups and SUVs don’t deliver anywhere near 30 mpg on the highway. Gasoline for a 25-mpg vehicle would have been $72. By driving electric we didn’t push our car 591 miles closer to an oil change or new spark plugs – EVs don’t need either – so I figure the Bolt was cheaper to operate by any measure. Chevrolet introduced the 2017 Bolt late last year, and while sales haven’t been stellar, they’ve slowly been picking up steam. It is only marketed to date in 16 states, with four more to be added in July. Chevy says it will be a 50-state car by the end of September. The Bolt’s been reviewed by all the buff books, by consumer sites such as Edmunds.com and Kelly Blue Book, and by specialty sites such as Green Car Reports, so I won’t bore you too much with my impressions – I agree with the mostly positive and glowing reviews the car’s been getting. The 2017 Bolt EV is a good-looking small hatchback with flexible cargo space, plenty of room for four – five on a short trip – lots of all-electric pep, a quiet and well-appointed cabin, a substantial amount of standard equipment and impressive high-end safety options such as automated following, lane keeping and pedestrian detection and braking. And it is a blast to drive. The price can sound high, $37,495 for the base LT and $41,780 for the Premier. Options can nearly $2,000 more. But remember you are paying for a battery-electric drive system that frees you from expensive gasoline as well as from tune-ups, oil changes, transmission repairs and other potential costs of ICE ownership. There’s also a federal income tax credit of up to $7,500 for the 2017 Bolt EV, plus, in some states, state and regional tax credits or cash rebates. That can make the cost a whole lot more palatable. 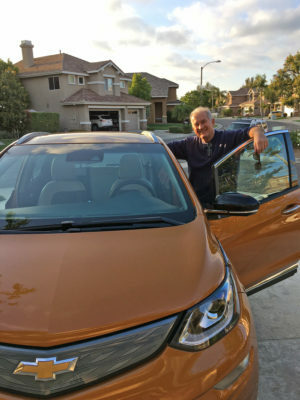 Cons are few: Chevy made fast charging capability on the 2017 Bolt EV a $750 option; you can’t tow anything; and the seats can feel a bit hard ‘til your anatomy adjusts. Go online before you leave and search the various charging station locators to see what stations are located on your route, and where. You will have to filter out everything but the DC fast chargers. Be prepared to change your route to ensure you’ll be able to find a charger when you need one. Some sites have route planning functions – enter your start and destination points and you get a map with charger locations along the way, including alternative routes. When spacing your charging stops, account for the fact that that the car will use more energy when you are driving at freeway speeds with little opportunity to benefit from regenerative braking than it will in stop-and-go city traffic. Weight also affects energy use, so account for the number of people and amount of cargo you will be hauling. A good rule of thumb is to figure that your real range will be about 20 percent less than the EPA-estimated range (so for the 2017 Bolt EV, with an EPA estimate of 238 miles, we figured on no more than 200 miles of real-world range and no more than 150 miles between charging stations. At 70 mph that’s a bit more than 2 hours of driving between stops. Remember that most hotels still don’t have charging – of any kind, much less of the fast-charge variety. Find the fast charger nearest your destination hotel each night and make sure you plan your last pre-destination charging stop so you’ll have enough juice after checking in to get to the nearest charging station. If you are planning to travel via EV and don’t have a friend to visit who’s conveniently located on your route and near a fast charge station, bring a couple of good books or a board game you like to play (or catch up with emails and social media stuff on your smartphone). You’ll be surprised how fast the charging sessions goes and how refreshed you’ll be after the enforced break. We left home about 10 am to avoid rush hour traffic through the Los Angeles metro area and headed north to our first charging stop in Santa Barbara. The predictive range readout on the 2017 Bolt EV’s instrument display said we had enough juice for 199 miles. We arrived in Santa Barbara’s La Cumbre Plaza shopping center, site of a pair of EV go fast chargers, with 142.6 miles on the trip meter and an indicated 65 miles of remaining range –a little better than what the Bolt’s computer had predicted when we started. We ate lunch at a seafood restaurant in the center while the car charged and left with 137 miles of indicated range, more than enough to reach the next stop. That was in the college and old mission town of San Luis Obispo, 102 miles away. My wife visited a friend who lives there while I drove the additional 4.8 miles from her house to the shopping center where EVgo has installed a pair of DC fast chargers in a service alley behind a supermarket. It took a few turns around the parking lot to find them because there were no “EV Charger” signs anywhere that I could see. I plugged in and walked to a nearby fast-food restaurant to get something to drink (most fast-charge stations are near restaurants and/or coffee shops), then read a book until the charging session ended after adding 71 miles of range. The computer said we now had 107 miles worth of juice; the trip meter showed we’d covered 248.9 miles since leaving home. I drove back to our friend’s place, visited for a bit and the three of us went out for dinner. Afterward, we dropped our friend back at her place and drove the final 28 miles to our hotel in Paso Robles. No EV charger there – not even a 120-volt outlet in the parking lot that we could have used for an overnight trickle charge. So we eschewed buying breakfast at the hotel (their loss) and drove a few miles to the downtown, where the fast charge station stood all alone in a restaurant parking lot about a block from the city’s historic plaza and shopping area. Our range indicator showed 66 miles when we plugged in. We walked a bit, ate breakfast at a local restaurant and window shopped before returning to the car. An hour’s charge had added 101 miles of range and the Bolt’s computer showed that we had 167 miles to play with. We drove to our favorite olive oil processor in the hills outside of the city, then to a couple of wineries. The stop-and-go driving and braking on the curvy roads in the area added quite a few miles of range through regenerative braking (as did our lower speed’s positive effects). By the time we’d driven back to San Luis Obispo we’d put 66 more miles on the odometer but the Bolt still was showing 137 miles of range. I probably could have passed up the SLO charging session, but decided that discretion was the better part, etc., so we plugged-in. Half an hour later we departed with 180 miles of indicated range and 354.7 miles on the trip meter. Our final charging stop for the 2017 Bolt EV was back in Santa Barbara, with 69 miles of indicated range remaining and 457.9 miles on the odo. We plugged in, walked to a different restaurant in the shopping center for dinner and found when we returned that the session had ended and we had 139 miles of indicated range – about 5 miles less than we’d need to get home if we used as much power going as we had coming. We called EVgo and authorized a second charging session, caught up on emails and chatted. After 30 minutes more on the plug, the Bolt’s range readout showed 188 miles. When we got home, 133.6 miles later, the readout showed 39 miles of range remaining. The second charging session had saved us from running out of power about 5 miles from home – and that was well worth the extra few dollars. Chevrolet provided a one-week loan of a 2017 Chevrolet Bolt EV to facilitate this article.